If you’re looking for a modern alternative to the traditional wedding video in Scotland, the UK or anywhere in the world, I might just be your man! I’m Barry, a Geordie from Newcastle residing in Scotland, and I’m a fanatical traveller and film maker. That’s me on the left (obviously – stop sniggering), and I like to think of myself as a ‘Film Ninja’ as I’m a very discrete, no nonsense film maker! Wedding videography in Scotland doesn’t have to be cheesy and traditional, but don’t take my word for it, check out my collection of wedding film highlights below! Rachael & Dominic chose the fantastic Errol Park estate to marry, a stylish venue for an awesome couple! There was an an outdoor ceremony, prosecco in the sun and a packed dancefloor later! Fiona & Greg married at the ever wonderful Crear, marrying outside on a warm sunny day before taking some time out to hit the beach! An awesome sunset wrapped up a perfect day! Fiona & Michael tied the knot in the barn at Harelaw farm, a beautiful setting to marry, before partying with their closest friends and family in the barn! Nikki & Nick celebrated in style at the amazing Errol Park in a day full of style, fun and laughter! Oh and some highland cows got in on the action as well! Not everyone who gets married chooses to commission a wedding film. You might still be deciding if you want one yourself, and you may be wondering if it is worth the expense? Well, in my opinion, film can evoke a sense of emotion from your day which is different from your photos. A film conveys emotion through movement and sound, as well as the visual elements. The right film can send shivers up peoples spines, and take them back to relive those special moments over and over again. Picking the right videographer for your wedding is not an easy task, and you’ve probably realised that there is a quite a ‘variety’ of styles of wedding videos from traditional documentary style to more modern, reportage styles. What you see here is my style. Megan & Martin married at the wonderful Dalduff Farm in Ayrshire, one of my favourite venues that combines a rustic feel with some amazing backdrops. 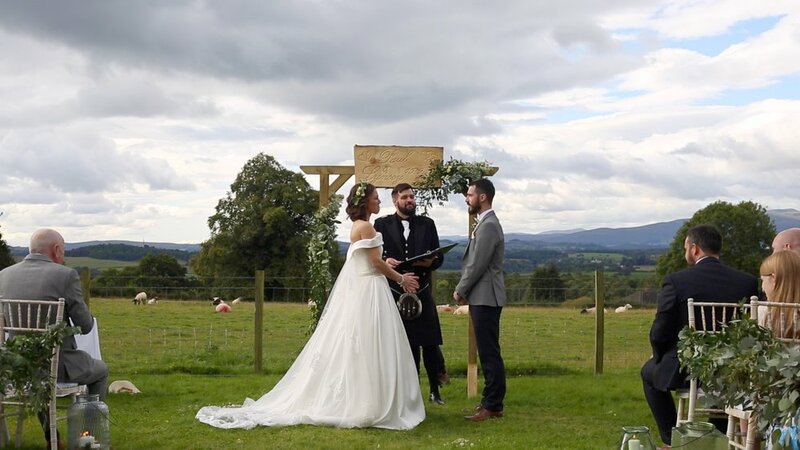 Lynsey & Paul’s stunning wedding was filmed at the beautiful Three Sisters Bake @ killearn Village Hall. They has such a beautiful day and an epic sunset as well! The wonderful wedding of Lydia & Ali, set in the stunning grounds of Wedderburn Barns in the Scottish borders! These guys had such a great day and amazing weather! Rebecca & Scott had such a brilliant day with friends and family! And where better to get married than in a teepee in your back garden! This was a joy to film! Tess & Colins beautiful wedding day took place at Bogbain Farm, just outside Inverness. It was a day with nature, family, friends and lots of fun! 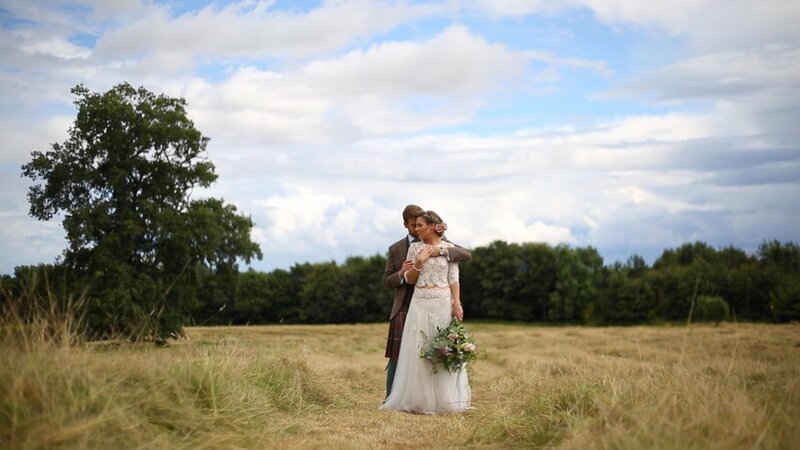 Carley & Fraser’s cracking wedding day was full of style and beautiful details, and Kirknewton Stables provided the perfect backdrop for an incredible day! So Why Should You Get In Touch With Me? I’m a no nonsense film maker. I won’t turn up with huge video cameras and stick them in peoples faces, I’ll be inconspicuous with my camera and I’ll be dressed just as smart as the guests. I’m passionate about crafting lovely looking films. Your guests will barely notice me, which is the only way to catch people at their best. Oh and I have been known to open and serve prosecco and champagne as you get ready: what’s not to like? My package is very simple. For me to create a wedding film of your day, I need to be there ALL DAY. So I’ll be there for the bridal preparations (and groom preparations if on same site), the ceremony, mingling between ceremony and dinner, the speeches and the first few dances. So normally from 10am until about 8pm (10 hours). I do this because I’m there to capture your wedding day, not part of it. Sarah & Neils wonderful wedding was filmed at Crear on the West coast of Scotland. The ceremony was a highlight for me, filming on a sunny day on the beach near the venue. What a day they had! Emma & Mark married in the beautiful grounds of Monachyle Mhor! They were surrounded by friends, family, epic scenery and beautiful views, what a way to spend your wedding day! This is the highlights film that you’ve seen on my website. A snapshot of your day encapsulated in one song. Its the most easily shared version, as its short enough to show people wherever you are, yet long enough to deliver the emotion and experience of your special day. This is a firm favourite of all my couples, one to be watched over and over again. Once you’ve had a taster of your day with the shorter highlights, settle in for a longer viewing with this edit! I’ll craft a film that shows the emotion and feeling of your wedding day, all accompanied by a cracking soundtrack. Relive everything from the preparations in the morning, right through to the party in the evening, and everything in between. The most important (and nerve racking) part of the day, and I’ll capture it all. From the bride walking down the aisle, to the readings and vows, you’ll receive a copy of the full ceremony to cherish forever. You’ll also receive a copy of all the speeches, so you can relive those witty one liners and dodgy jokes for years to come! Ah the first dance. Whether you drift from side by side, or deliver a well rehearsed, choreographed glee esque performance, I’ll capture it all. And I’ll stay for a couple of songs after to record some moves being busted on the dance floor too. Thank you for your enquiry, I’ll be in touch shortly! By clicking the button above you agree for me to store your information and contact you via the details you have submitted. You can inform me to delete your contact information at any time. Your privacy is important to me and I promise not to spam you.